Sanrio’s Gudetama is very popular in Japan. This caricature of an egg yolk is so famous that there is a Gudetama-themed café in the land of the rising sun. Even in the US, people just adore this quirky egg creature. You will find iPhone covers, t-shirts, toys and other fun stuff featuring the sad egg yolk. And now, there’s an addicting game called Gudetama Tap available at the Google Play Store. 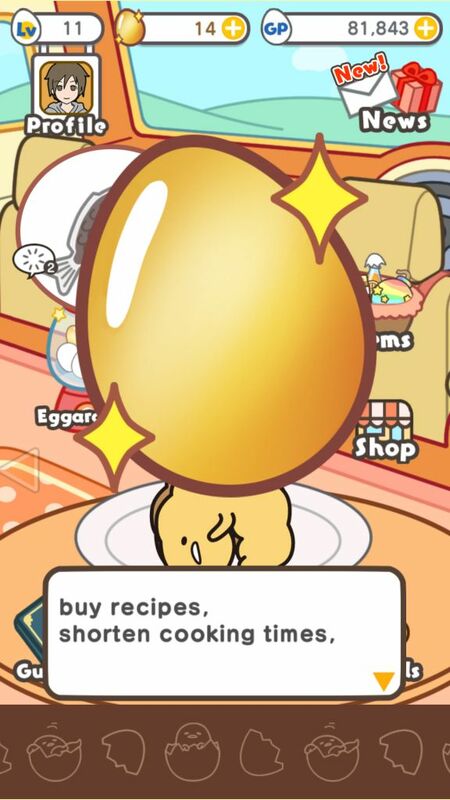 In this game, you will cook raw eggs to discover various kinds of Gudetama. When the dish is ready, you can place it on your table, poke it and in return get soy sauce and other goodies. You might hear it talk when you keep tapping it. The action begins in your kitchen. You will have to tap a kitchenware to start cooking. You will have access to various time-bound recipes. You will begin with 1-minute recipes and a simple cutting board and as you progress and reach new levels, you will unlock new kitchenware and yummier recipes that will help you discover new Gudetama. However, the time taken to prepare dishes varies from one recipe book to another. Tap an unlocked recipe book pinned on your RV’s kitchen wall. It contains a list of recipes that will let you make various types of cute egg yolk dishes. The time required to prepare a single recipe will be mentioned in the book. Now tap a recipe to place a raw egg on the kitchenware. Press the Cook button. You will need GPs (Gudetama Points) to begin cooking. GPs are easy to earn and you will receive some as rewards when you start playing. When cooking begins, the timer shows the remaining time left before food preparation is complete. Once finished, you will have to tap the kitchenware again to see the results. The results screen has a unique way of displaying the outcome of your recipe. It’s like a roulette game. The egg-shaped roulette is divided into three color-coded sections – Success, Surprise and Failure. If the wheel stops on the yellow section, the food you made is a success and you will get the same dish as shown in the recipe. If it stops on the grey section, you will fail and won’t get the desired results. However, if the wheel stops on the blue section, you will get a surprise dish, which would be very different from the recipe. There are certain items that can help you achieve success and get surprise dishes. I will show you how to use them later. Once the dish is ready, you can place it on the table. Tap No if you don’t want to place it. You can place the dish later, but for that you will need “Gudeguide” and a refrigerator – You can purchase these two at the Shop, under “Kitchenware”. The Gudeguide contains all Gudetama that you have created so far. Don’t worry, all your creations are saved and once you get the refrigerator, you will start to place your favorite egg dish on the table any time. After placing the cute yolk on the table, tap it. You will receive GP every time you tap it. The GP received depends on the level you currently are. So if you have reached level 3, then you will receive 3 GP per tap. You may need lots of GPs to begin cooking complex recipes, so save them to cook delicious dishes. You reach a new level when you discover a new Gudetama. Keep tapping the cute egg yolk until it speaks. Yes Gudetama speak and they sound damn cute. Don’t stop. When they speak, it’s a hint that you might get a gift from them, so keep tapping even after they utter words. Gifts include lots of soy sauce (which convert into GPs when you tap to collect them), items or rare phrases uttered by an egg. Collect rare speeches so that you can listen to them via the Gudeguide. Oh and did I tell you that you will be rewarded for getting a new speech? Now that you know how to play Gudetama Tap, check out these useful tips and hints that will help you unlock new recipes and collect more eggs. As explained in the “Getting Started” section, you will have to finish cooking and spin the egg roulette to see if your newly created egg dish is a success or not. With certain ingredients, you will increase the chances of being successful in cooking. These ingredients can be earned by completing Daily and Normal challenges, spinning the red eggarapon machine or helping a friend cook an egg dish in his room. There are various types of secret ingredients such as secret ingredient S, L and M and each ingredient has varied effects on cooking. For example: Secret ingredient S slightly increases the chances of success in cooking whereas ingredient L greatly increases success. Choose your ingredient wisely when you spin the roulette. Use the L ingredient, if the grey area covers a large part of the roulette. While it’s the yellow section that will cover a large part of the roulette, but sometimes, the grey part stands out as it covers more than 25 percent of the roulette and the wheel might stop at this area. This usually is seen in rarer recipes or those that take more time to complete. You should use the M or L ingredient to increase the chances of success in such recipes. You can use “Mysterious Chemical” to increase the chances of getting a surprise Gudetama. If you use this ingredient just before spinning the roulette, chances of the wheel to stop at the blue area are higher. If you have bouillon cubes, then use them to slow down the roulette wheel. The cube’s grade determines how slow the roulette wheel will move. If it’s “S” grade than it will slow down by 5 percent, but if it is an “L” grade cube, then expect a 15% slowdown. Use the L grade cube in recipes where the grey area covers most part of the wheel. With the wheel slowing down, it will be easy for you to tap the right time when it moves towards the yellow part of the roulette. To use all these ingredients, you will need to go to your kitchen. Tap a kitchenware. Tap a recipe and press the “Cook” button. 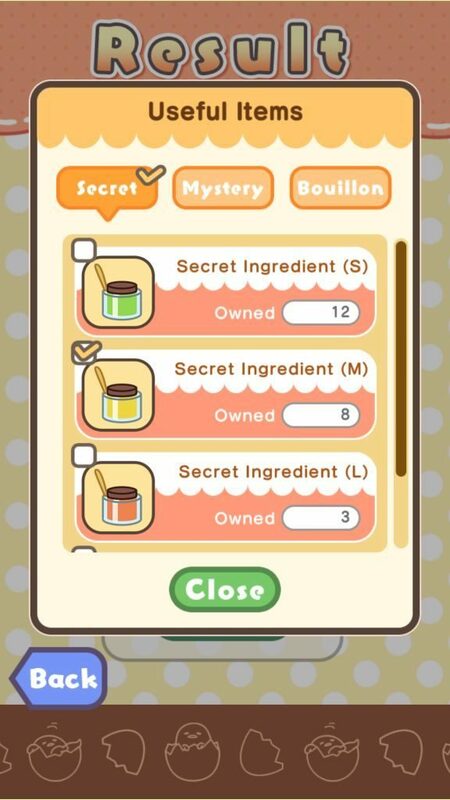 When cooking is complete, Tap the green “Items” button in the Results screen and select a secret ingredient, mysterious chemical or a bouillon cube. Your selection should depend on the roulette’s layout and how much of it is covered by success, fail and surprise areas. Use the mysterious chemical on recipes where you have achieved success in discovering a new egg. You can use the same recipe again to get a surprise egg, and this is when you should use the mysterious chemical. Golden eggs can be used to unlock new recipes at the kitchen and accelerate cooking times. You will need them if you don’t want to wait for hours for the food to be cooked. Save golden eggs only for these two purposes if you are keen on discovering new recipes and Gudetama. While cooking eggs on a kitchenware, tap the “Rush” button and then tap the “Use” button to spend 2 golden eggs to accelerate cooking time. The number of eggs varies according to the time taken to prepare an egg dish. When you get a new Gudetama, the game will let you share your discovery via social networking sites such as Facebook, Instagram and Twitter. You will just have to tap a social networking icon to share your new creation to get a golden egg. You can even share your failed dishes to get eggs. Try it. You get one golden egg as a daily login bonus, so make sure you open the app every day. There are certain challenges that offer such eggs. For example, Normal Challenge no. 25 grants 5 eggs to players who play this game for 2 days. You will receive eggs as pre-registration presents, so don’t forget to tap the presents icon at the top-right corner of the screen and claim your reward. Look for hidden Gudetamas all over your RV and share them via Facebook or Twitter to get an egg. You will also get some rewards, like GPs and items when you find a hidden egg. You will receive rewards from Eggarapon machine. Share these rewards via social media sites to get a free egg. Tap the screen just above “GPS” in your RV to bring out “Lucky Chance”. You just have to watch a video to get a lucky prize. You will get five chances per day. Tap the Yes button, watch a video (you must have Internet connection) to get your prize. Usually, you will receive silver eggs. Keep playing Lucky chance, collect 100 silver eggs and trade them with 1 golden egg. All silver eggs will be converted into a golden egg once you reach the 100 mark. Once you have accumulated 50,000 GPs, go to shop and purchase the Roulette Plate. It can be found under “Kitchenware” in the shop section. With this item, you don’t have to wait for the roulette wheel to stop as you can stop it all by yourself anytime. Just tap the screen when you feel it’s the right time to stop and the wheel will stop. This item can be very useful for rare recipes as you chances of getting a successful egg yolk variation is lower. The plate, combine with certain ingredients will help you achieve success in your quest to discover adorable Gudetama. 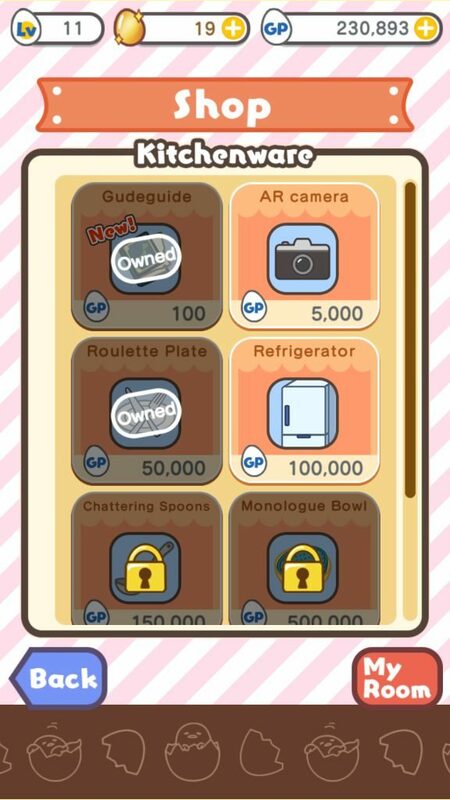 You will receive surprise gifts if you play the Eggarapon mini game. There are two types of Eggarapon – Green and Red. You get one free spin daily to use the Red and Green machines. Once you have used up free spins, you will need “Pon tickets” to spin it. You will get Gudetama-centric prizes, such as AR stamps if you spin the green one. 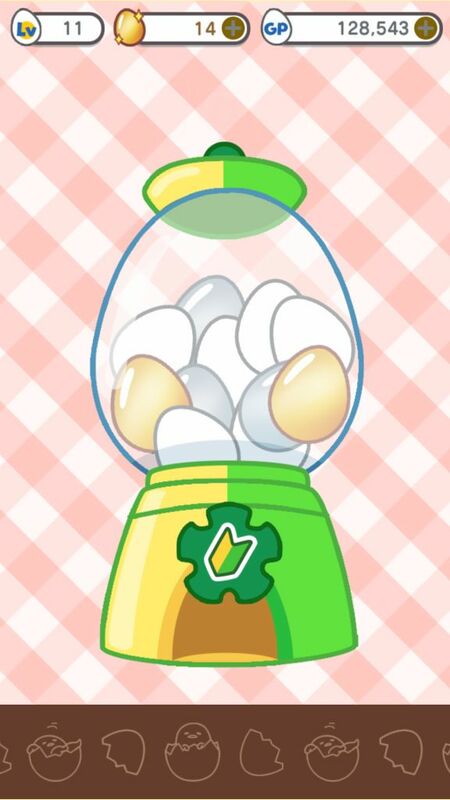 To spin the red one, you can red pon tickets or 50 golden eggs. You will receive a surprise gift, such as a secret ingredient, from the red machine. You can get these tickets as pre-registration/release celebration rewards. Tap the “presents” section to claim them. You will still get your GP reward if you select “No” and don’t place it on the table. You can place the recipe anytime if you have the refrigerator placed in your room. Please note that when you make a gudetama, you will have to spend GPs to prepare the recipe. How to send gifts to friends? Under the “select recipient” there’s nothing pop out. You can send only those eggs that are in your friend’s “Wish list”. The reason why you couldn’t see any recipients is because the egg gift is not featured in their wish list. To see a friend’s wish list, tap “Friends” and then tap “Details” under a friend’s profile. Under Wish list tap an egg. A new screen will pop up, which will allow you to send that egg as a gift to your friend. You can send that egg if you have created it in your kitchen. Where does this phrase appear? The phrase appeared in my notifications when I hadn’t played the game for a few days. Hi do you have any idea how to recover your game? I uninstalled my Gudetama Tap game and I could not recover it. I linked my previous game on Facebook. Have you used the app’s “Device Transfer” feature to transfer data? This could have let you recover your data after reinstalling the app. When a player uses this feature he can save progress and transfer the saved data to another device or the same device in case he/she uninstalled the app or lost device. All the player has to do is get a device ID by creating a password and enter the same ID to recover/transfer his/her saved data. I cannot find the “hidden” gudetama. I have tried clicking everything and still no luck. Is there something I am missing? They just appear randomly and float across the screen. Does anyone know how to gift items to their friends? I’ve received several items as gifts from folks but can’t figure out how to send gifts! Do you mean gudetama or items? I can send gudetama to my friends. I guess you received those items after helping your friends in their kitchen? You get items when you increase bond and one way of doing this going to your friend’s room and helping your friend cook by tapping kitchenware and using an item to assist her. The first menu contains 4 menus right? However on the page it only has 3 menus, please do tell me how to flip the pages? Thanks! I guess that one extra menu is the surprise recipe. You will notice every booklet has one menu missing, probably because it’s the “surprise” recipe. 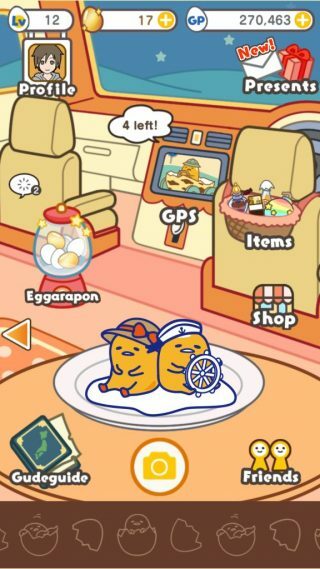 Has anyone found the hidden gudetama? Tap the “Gudetama Scream” painting in your kitchen wall to get one. There’s another hidden UFO-shaped egg yolk called the “Unidentified Egg”. You will find it in your RV’s main room. Keep looking around and tap on new objects in your RV. I must be too new yet (level 11) to have those yet, but thank you for the info! I found both of them when I was in level 11. Maybe something has changed with the new update, which is why you couldn’t find them?